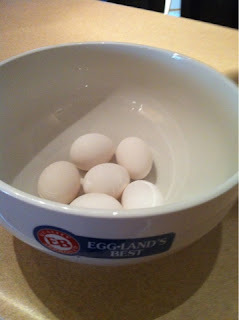 I was offered the opportunity to host a brunch with Eggland's Eggs. They sent me a gorgeous ceramic bowl, coupons for eggs, a cute cutting board and other goodies. If you've been with me, you know the last 6 months have been long and stressful. Bo doesn't really like eggs, but when he's out of town, scrambled cheesy eggs is my go-to comfort meal for me and the kids. It's a meal that I know will be met with agreement by all, and I know it fills their tummies. In fact, tonight was just such a night -- Bo out of town and we were feeling a bit out of sorts, so scrambled eggs with cinnamon sugar toast was dinner. It was delicious! I did remember the task given me, however, and last week we enjoyed a wonderful Sunday morning breakfast with french toast (made with Eggland eggs) and fresh berries. And, later that day, I made this wonderful pineapple upside down cake (link to recipe) In fact, there are a bunch of great recipes at the Eggland website. One thing I learned at their website is that the polystyrene containers are recyclable, and have less environmental impact than the paper cartons! I also like the fact that the feed they give chickens does not contain any animal byproducts, hormones, antibiotics or other nasty stuff. I'm excited to tell you that they have a great gift pack for one of my readers! 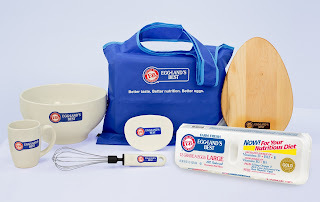 The gift pack includes a coupon for Eggland's Best Eggs, a ceramic bowl, a ceramic mug, a wooden cutting board, a whisk, a scraper and a reusable bag! If you would like to enter the giveaway, please follow this link to my giveaway page and fill out the necessary information. Entries in the comments will not count for the giveaway. On the giveaway page, you will enter your name, email, name of giveaway and answer to mandatory question. You will get an extra entry if you have liked my Facebook page. 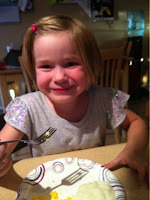 Giveaway ends April 17, 2013! Mandatory Question: Which recipe from the Eggland site would you like to try? We love eggs of all kinds at our house, but cheesy scrambled eggs are one of my quick go-to meals too. Great giveaway, thanks! Corn & Zucchini Flan is on my list of things to make this week. Have never tried it before. Sounds really good! I'd like to try the recipe for the Hangover Breakfast Burrito.